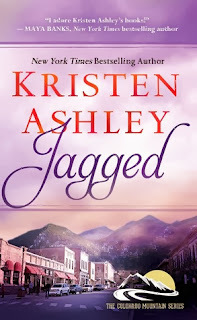 Jagged is the 5th installment in Kristen Ashley’s Colorado Mountain Man series. We first meet Graham Reece in “For You” book number 1 of the burg series. He is an old flame of the leading lady in that book and finds himself in a bit of unwanted trouble. Though he makes an appearance in “For You” it is not necessary for you to read it before you read Jagged. Reece is a drifter, a nomad of sorts, he doesn’t stay in any one place too long and he rarely goes to same city twice. Except for of course, the town of Gnaw Bone, Colorado. That’s a town that he visits with some frequency because that’s where Zara lives. Reece and Zara share a history, they’ve known each other for years and have carried on a mostly friends with benefits relationship throughout that time. Though Reece is 11 years her senior, the difference in age between the pair is never really an issue, Zara is mature for her age and she cares for Reece deeply. Too deeply, because the truth of the matter is that for Zara, Reece is the one. Zara is selfless, she watches Reece walk out of her life time and time again and she lets him go, never gives him a hard time about it because she knows what kind of a man he is and she accepts him for who he is, even if it means loving him from afar, and even though Reece cares for her, probably more than he’s ever cared for anyone, he knows deep down that he can’t give her what she wants, and so when Zara decides to cut ties, it hurts him, but he lets her go, in hopes that she’ll be able to make a life for herself. She tries to move on, tries to live a life that looks good on paper, tries to love someone other than Reece, but deep down Zara knows that, living that life is living a lie. So when Reece returns to Gnaw Bone and the pair reconnects, he finds her life is just a shadow of what it used to be and makes it his mission to help her find her way again. Can Zara open up and tell Reece what she really needs and wants from him? Will Reece stick around long enough to let love into his life? Will the pair of them fight to be together? Pick up Jagged to find out, Kristen Ashley does not disappoint. The First two books (as seen below) have the new cover and you can click on the cover to purchase the books.